I’ve just received a new copy of The Books of the Bible! I’ve been making very positive noises about this for a while. It has just become available in Australia, but my mate Kutz has got a couple of copies to give away — if this will be useful to you, let me know in the comments below! This is my go-to Bible for everyday use, because The Books of the Bible is a reader’s Bible, designed for reading instead of referencing. And that’s a big deal. But I’ve talked about reader’s Bibles recently, and I’ve previously reviewed the original version of The Books of the Bible, so all I really want to do here is give you a feel for it. There are photos below. 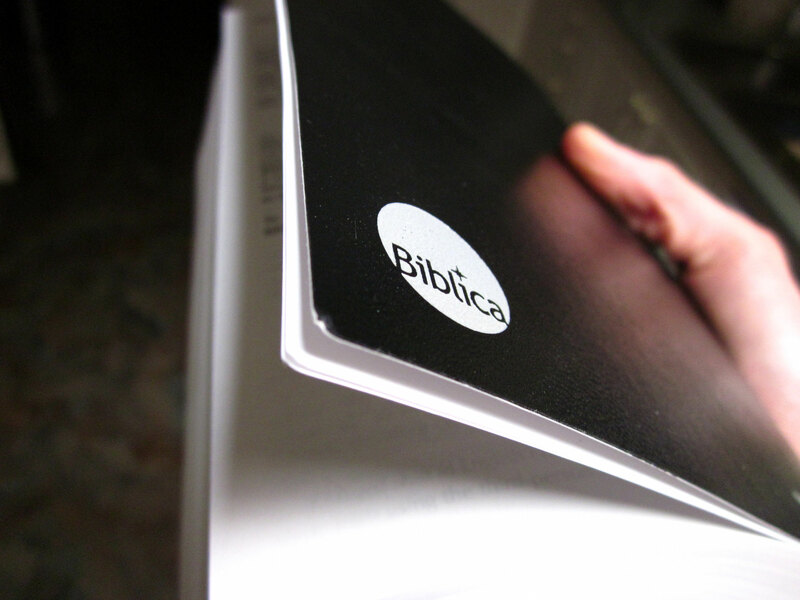 Biblica. Go you good thing. 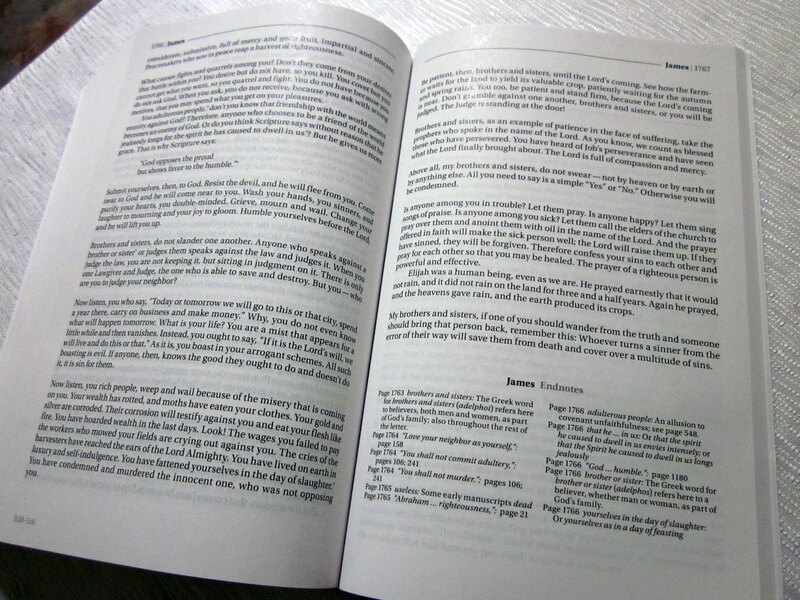 This new edition of The Books of the Bible has two main changes: the latest NIV translation (which updates and supersedes the TNIV) and a more pleasing and readable typeface. And hey, with me looking like I’m on Biblica’s payroll or something, let me add that The Books of the Bible isn’t perfect. At its widest, the text column squashes text into the gutter. This doesn’t pose such a problem for passages set in verse (see Ecclesiastes below), but elsewhere it can impinge on readability. 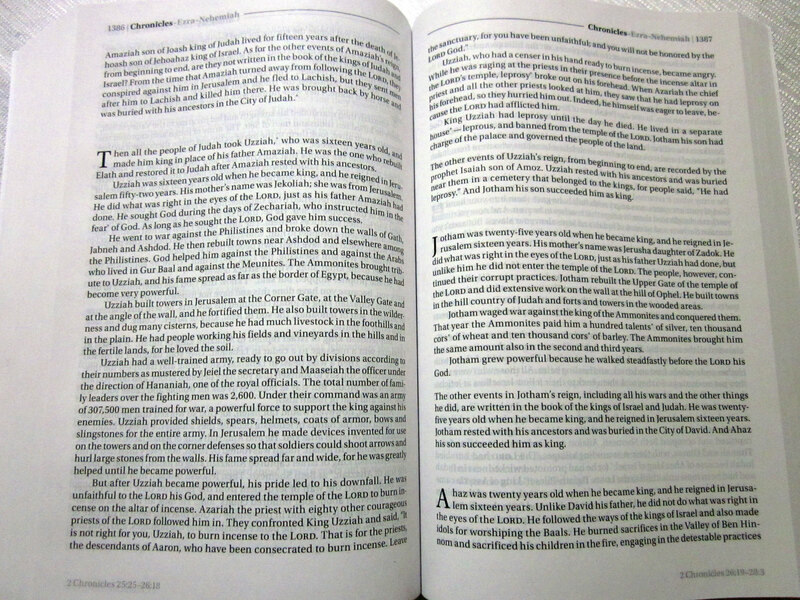 So, when it comes to page design in reader’s Bibles, The Books of the Bible isn’t the gold standard. (Follow Bible Design Blog if that’s what you’re after!) But this is hardly a problem at all, by virtue of everything else it achieves. 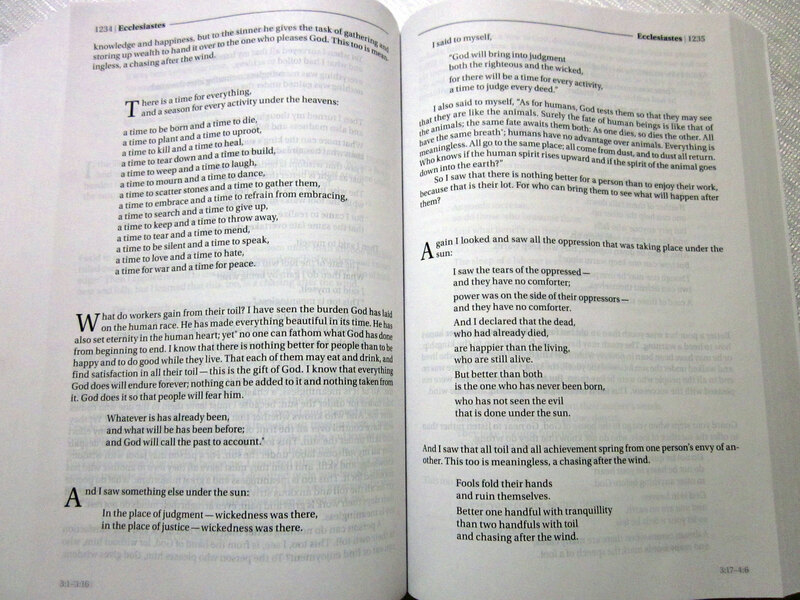 The thing is, The Books of the Bible serves to alter the reading experience in the most wonderful ways. It’s a reader’s Bible through and through, and that makes it a zillion squillion times more readable than a reference Bible — in other words, just about every Bible you’ll find on a shelf. Real reader’s Bibles are still a bit of a rarity, and The Books of the Bible is perhaps the first that could make true reader-based design commonplace — and that’s one thing which could genuinely improve our Bible reading on a massive scale! At the same time, The Books of the Bible steers us away from simply seeing Bible reading as an end in itself (see the “drama” page below). This is a large book (it weighs 1kg or so), so if you’re after something for easier handling, there’s a four-volume version on its way (the New Testament and the beginning of the Old Testament are already available). Nothing remains except to say: get yourself one and read. 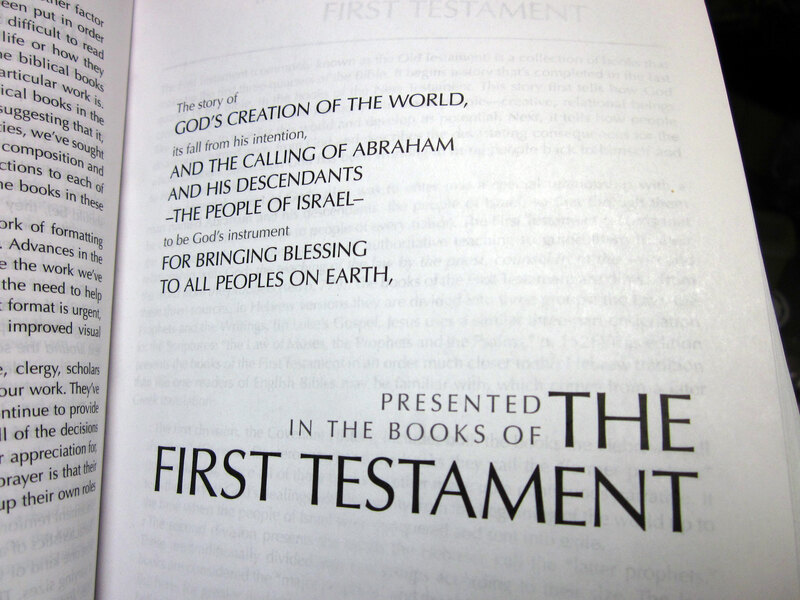 A handful of introductory pages give helpful pointers about what the Bible is supposed to be. 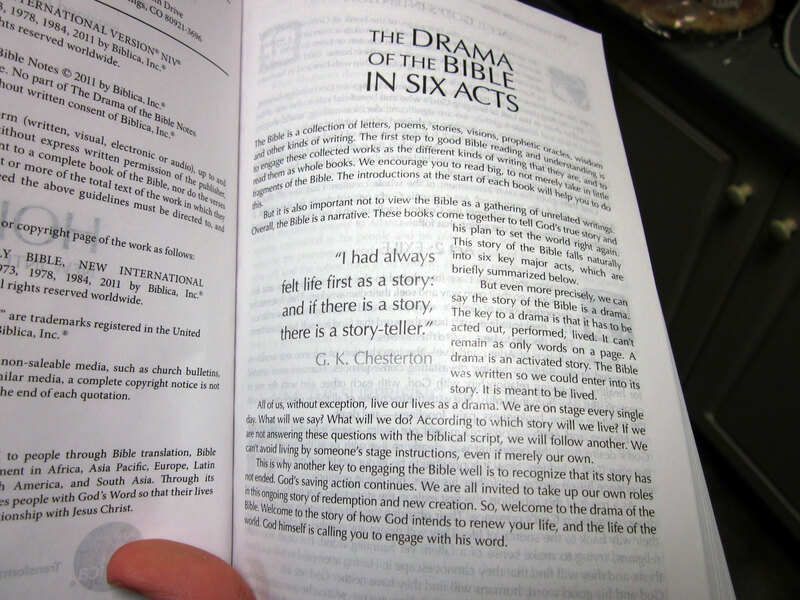 The “drama” idea is inspired by evangelical scholars such as Kevin Vanhoozer. 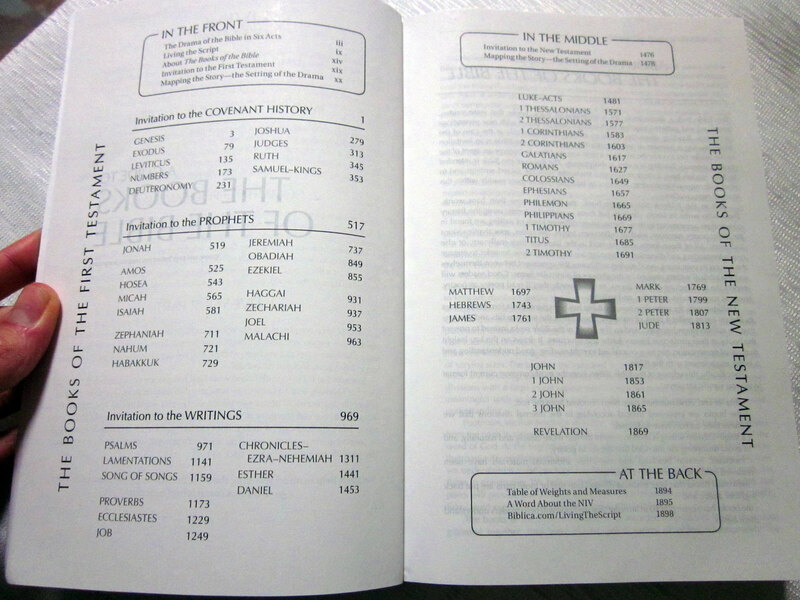 The Books of the Bible changes the order of the books. This can be extremely helpful—for example, it encourages the writings of Paul to be read chronologically rather than from longest to shortest! Super-short introductions to books and sections help us to form accurate expectations without getting overwhelmed by information. Out with numbers, in with readability! 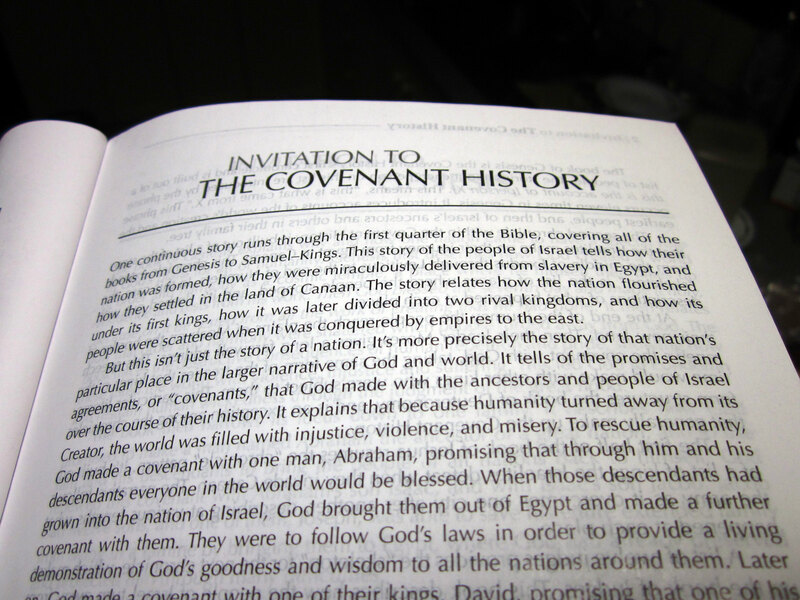 The NIV notes have been included but shunted to the end to encourage uninterrupted reading of the books. In your photos, it looks like the paper is thin to a level where you can easily read the next page without turning – is that the case, or just your lighting? This is a mass-market paperback, the paper is durable but thin, and the ‘ghosting’ effect is more or less as you see in the photos… True aesthetes should consult Bible Design Blog. I would love a copy! …so I’ve actually already ordered one through WORD. I’m really looking forward to using it! Ooh, I’ve been trying to get one! I’m hoping to get it as a Christmas gift, fingers crossed. Looks great! Thank you for reviewing it, Arthur, otherwise I never would’ve heard of such a thing! After reading your review of this (and the earlier review), I went looking for a copy. Where do you get them from though? Well, if you insist… I’d love a copy! OK, Ian, Elizabeth, and Mara — tell me your postal addresses via atdavis AT cms DOT org DOT au and we’ll send them on their way! Thanks heaps Arthur (and Kutz)! Oh – am I too late?! I can get you one too, Richard. Just email Arthur your address. Hi! I’ve been trying to get my hands on a copy (a little tricky here in Cambodia). Are there any left? Sorry, Campbell, we’re out of promo copies here. You could get a friend to pick one up at Koorong and post it. Campbell – do you know Wim & Maaike Prins? They are heading back to Cambodia next month (Siem Reap). I can’t offer on their behalf to carry a book for you, but could check with them if you think that might work. Hi Arthur and Richard! No, I don’t know the Prins. I’m trying to get my family to get me a copy and post it to me. Unfortunately, when they went to Koorong, Koorong didn’t know anything about it. I’m sure I’ll work something out. In the meantime, I’ve got the NT on Kindle. Thanks for your suggestions.